Quick and easy sharing of vCards on a local network. Is there a better alternative to Bonsoir? Is Bonsoir really the best app in Email category? Will Bonsoir work good on macOS 10.13.4? 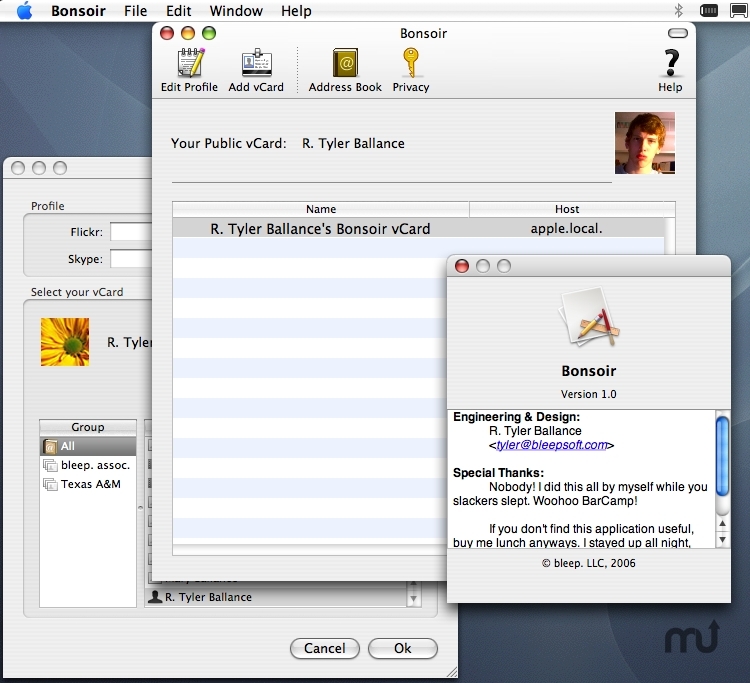 Bonsoir takes advantage of Cocoa Distributed Objects, Bonjour, and the Address Book API for allowing the quick and easy sharing of vCards on a local network. The basic idea was that everybody could grab Bonsoir here at BarCampTexas, select their vCards, and we could all add each other (into Address Book) to help keep in touch for the next BarCamp, etc. Bonsoir needs a review. Be the first to review this app and get the discussion started! Bonsoir needs a rating. Be the first to rate this app and get the discussion started! I've released the source to Bonsoir 1.0 under my special "BarCamp License". It's not the cleanest code in the world, there's a gratuitous amount of swearing in the comments, and the application doesn't even have an icon.